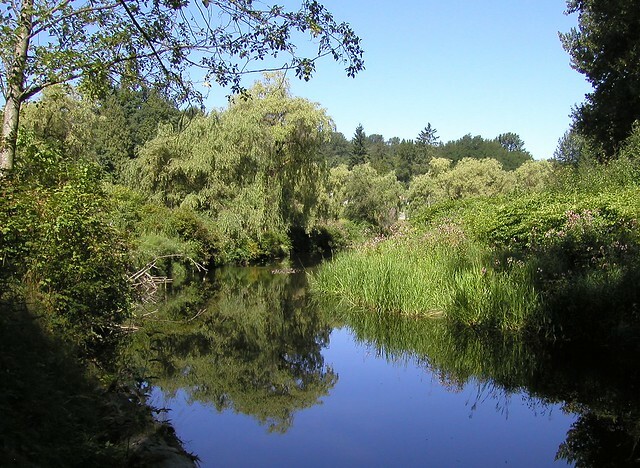 This morning I asked my Twitter followers for suggestions for my Metro Vancouver Park Series, a collection of posts that has been put together by guest authors, reader suggestions, and through my personal experiences. @MaryAnnMcKenzie responded: “Hume Park in New West. Fields, playground & water park at top level + cool trails & secret places leading down to river.” Thanks to Mary Ann, Hume Park is this week’s feature. New Westminster’s 31.72 acre Hume Park is split into two points of access, Upper Hume (via Kelly Street & Braid) and Lower Hume (via Columbia Street, just east of Holmes Street). Parking is available in a lot through the Lower Hume entrance and street parking can be found near the Upper Hume entrance. Although I have been to Hume Park before for group picnics, I have never explored its forest trails and creek paths down toward the Brunette River. Needless to say, the Brunette-Fraser Greeway is now on my weekend “to do” list. Three tennis courts, water park, adventure playground, outdoor pool (seasonal), three baseball diamonds, lacrosse box, softball diamond, soccer field, trails and greeeways (connecting to the Brunette River), picnic shelter, picnic tables, and forested trails. There is also an off-leash area for dogs. The pool is open from the last weekend in June to Labour Day, and washroom facilities are open from April to mid-October, from 8:30 am to dusk. The playground is currently getting an upgrade (see design plans here) and should be ready for romping this May. The existing playground equipment will remain in place, this will be an expansion. New Westminster, our province’s original capital, is rich with history as is Hume Park which is named after Frederick J. Hume (1892-1967), a descendent of two of the original Royal Engineer families that settled in Sapperton. The ﬁrst trail from the Royal Engineer’s camp, surveyed and constructed as North Road in 1859, skirted the future park site. The trail was a military precaution, built to protect the capital city from potential American attack should the Fraser River freeze solid and the Americans launch an attack from the south. North Road provided a strategic access to Burrard Inlet to forestall such an eventuality. Fortunately, the feared American takeover of British Columbia never materialized, and the trail eventually proved more suitable for the survey and settlement of suburban lands and district lots. The property was acquired during a land boom by the B.C. Distillery Company for potential factory or residential subdivision development. The land was soon determined surplus to the company’s needs, but the threat to their much-loved picnic site so alarmed local Sapperton residents they presented a petition to City Council in March, 1912. Mayor Fred Hume has a vision for the park in the 1930s and didn’t let the Great Depression slow down its development. By 1937, things were underway. Every aspect of the original plan was completed. The quality of craftsmanship and attention to detail by city relief workers exceeded everyone’s expectations. The playground and gardens carved out of the woods beside the Brunette River became a matter of civic pride. You can read more about Hume Park’s history in this PDF document (quoted above) that is provided by the City of New Westminster. 1951 – VPL Accession Number: 47940. Photographer: Province Newspaper. Mayor Fred Hume (centre) with Brig Megill, R.C.A.F Gordon along Georgia Street. Fred Hume was Mayor of New Westminster from 1933 to 1942 and also the Mayor of Vancouver from 1951 to 1958 (while living in West Vancouver). He also owned the Vancouver Canucks in their WHL days and has been inducted into the Hockey Hall of Fame in the “Builders” category. Check out all 50 entries in my Metro Vancouver Park Series for fun, recreation, and local day trip ideas. Hurray for New West parks! We have many great neighbourhood parks, some of them hardly used. The new Pier Park is blah compared to some of the hidden gems we have around here!